What is RevoluSun Smart Home? As an extension of RevoluSun,Hawaii’s premier solar company, RevoluSun Smart Home is a curated collection of energy efficiency and lifestyle improvement products that will make the home more economical, healthy and comfortable than ever. Industry leading products include PV hot water, whole house fans, skylights and sun tunnels, home automation and security, EV car charging, among others. Why do Hawaii residents need solar storage? Hawaii’s Public Utilities Commission recently announced the phase out of net energy metering (NEM), which credits homeowners a market rate price for the solar energy created on their roof and fed back into the utility. Therefore, the time is right for battery storage systems to help store excess energy made in the day, for use in the evening by the homeowner. In addition, moving forward, there may be more modifications that include a new NEM rate, based on time of use. The Sunverge system is a perfect solution in this case as well, as it integrates seamlessly with the grid and can deliver energy when it is needed most. This is the missing piece to the puzzle for Hawaii, as we have no problem generating solar energy, but desperately need more avenues to use what we actually generate. For those in saturated grid areas or those who just want to get off the grid, this is the answer. How does the Sunverge storage system work? The Sunverge Solar Integration System (SIS) is an intelligent, distributed energy storage system that captures solar power and automatically delivers it when homeowners need it the most. The Sunverge integrated energy storage system includes a high-capacity battery, inverter and other smart electronics in a single, compact package. It is installed at the home and integrates with new or existing solar PV systems and provides a smart connection with the grid and the local electricity supply. Each unit runs software to automatically lower electricity bills, improve reliability, minimize energy export and protect the grid. Does the battery have to be stored in a specific environment? The Sunverge systems can be stored indoors or outdoors and are safeguarded by multiple layers of hardware and software controls. The units’ safety features include active and passive cooling for operation in Hawaii’s high temperatures, 24/7 remote monitoring and management, and a 10-year warranty. This is particularly important in Hawaii given many homeowners have carports, not garages, due to Hawaii’s weather. Is there a need for regular maintenance for the storage system? There is not any regular, additional maintenance required for the Sunverge Solar Integration System. RevoluSun does offer performance maintenance packages for all of its PV systems however. How is the solar and storage system monitored? One of the advantages of the Sunverge SIS is ongoing remote monitoring and performance optimization provided by Sunverge. Homeowners as well as RevoluSun technicians also have access to Sunverge monitoring and can view performance as well. On average, how much cost does the storage component add to a solar system and how long does it take to pay back with energy savings? The Sunverge SIS is modular and can be sized to support varying household energy needs. The Sunverge SIS starts at around $20k and, when sized optimally and combined with PV, can pay for itself in around nine years. An added benefit is the peace of mind of emergency back-up capability. When compared to traditional back-up generators (with automatic transfer switch ability) this can provide an additional $5-$10k worth of value. How will Hawaii benefit from solar storage? David Gorman leads all business development efforts for RevoluSun. 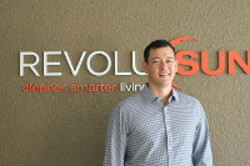 Prior to joining RevoluSun, Gorman spent over a decade in financial services and business development in New York and San Francisco, including work with various established financial institutions, including Pequot Capital, Morgan Stanley Smith Barney, as well as start-up software company, Capital IQ, now a division of Standard and Poor’s. In 2009, shortly after returning to Hawaii, he began working in the solar industry as the director of sales and finance for a Maui-based solar company. Gorman is a graduate of Punahou School and earned his B.A. in Economics from the University of Hawaii. He is the Vice President of the Board of Directors for Hui Malama Learning Center on Maui, and is a member of the Hawaii PV Coalition. Born and raised in Honolulu, Gorman resides in Hawaii Kai with his wife and two children.